Create an app that could help lead to a better understanding of the impacts of climate change on people's health. Put your GIS prowess to work for a good cause and enter the Esri Human Health and Climate Change App Challenge. Esri invites the worldwide GIS community to build game-changing apps that will help communities visualize, understand, and reduce climate change health risks. The effects of climate change pose real threats to people’s health around the world. Droughts, hurricanes, and other extreme weather events jeopardize infrastructure and safety. Rising temperatures cause more smog and longer allergy seasons. The result? Exacerbated health problems such as asthma and an increased likelihood of vulnerable populations, including children and the poor, becoming sick or injured. Understanding the geography of climate change is an important step toward mitigating its detrimental health impacts and creating a vibrant and sustainable future. And you have the tools to make a difference. “Esri is committed to helping communities work smarter and more efficiently to become more livable and, as a result, more resilient to climate change,” said Esri president Jack Dangermond. Esri will award three winners more than $15,000 in cash prizes or the equivalent in software. The deadline to enter the challenge is August 14, 2015. The app challenge is part of Esri’s comprehensive effort in support of the White House Climate Data Initiative [PDF] under President Barack Obama’s Climate Action Plan. Participants are encouraged to create apps using the Esri ArcGIS platform, with GIS tools and data that provide decision-making support for health professionals. The app challenge is open to everyone—developers, employees of start-ups and governmental and nongovernmental organizations, and academics. Participants are encouraged to use the growing pool of open data and Esri apps, maps, services, and APIs to develop their app. Judges will select the top three apps to be highlighted at the Esri Health and Human Services GIS Conference in September. 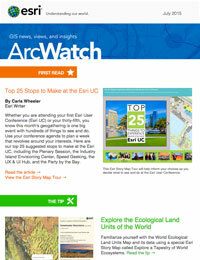 In addition to awarding prizes, Esri will feature the winning apps on its collaborative resource portal. For more information, visit esri.com/climate-app.